Only eight months after the inspiring World Cycling Championships in Innsbruck, the TOUR Transalp starts also in the capital of Tirol. This is an absolute highlight, as the city alone has so much to offer. Thousands of tourists from all over the world visit every year. Since the Transalp already starts in the city of the world champions, the route wants to meet their sporting demands. A tricky task awaits the cyclists, because this route is spiked with some demanding stages. You should not be fooled by the short starting stage from the Inn via the Brenner Pass to the banks of the Eisack in Brixen. Day 1 to get warm and bring your legs up to operating temperature for the "Transalp in the Transalp". The next three days will demand all your energy and willpower. Days 2 to 4 are true grain eaters, with a total difference of 10700 metres in altitude. The challenge is for world champions and the landscape worth every painful turn of the crank. For the first time in the history of the Transalp the Penser Joch, the extravagant Gavia Pass, the spectacular Umbrail Pass and one of the most scenic Alpine passes, the Bernina Pass, await you. 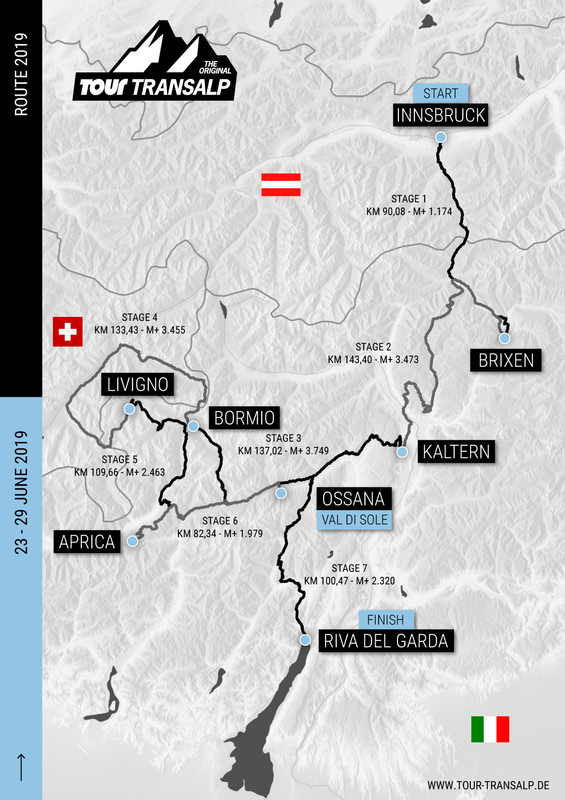 Anyone arriving in Livigno is welcome to pat themselves on the back, they have what it takes to end the Transalp. The hardest part is over, though the rest of the stages are not given as gifts. The famous Passo Mortirolo, whose ascent from Valtellina has often been climbed by the Giro, is still waiting. Actually, we will cross it twice. The second time not from the valley but rather over the shoulder of Aprica. On the last day, the Passo Campo Carlo Magno at Madonna di Campiglio awaits with great views into the Brenta. Further on the hidden Passo Daone, at the southern edge of this mountain massive. At last, two comparatively comfortable passes - the Passo Duron and the Passo del Ballino lead to the shore of Lake Garda. It’s time to enjoy the Dolce Vita like the world champions.